We're currently seeking an experienced plumber, with a valid NC drivers license, good past work history, and that can pass random drug screening. When a plumbing situation arises, you don’t have time to scour the Internet for different plumbers in Raleigh, NC. What you need is a plumber you know you can trust, who will show up to work quickly, provide expert oversight and get the job done right, all at a reasonable price. Affordable Plumbing Call Us 1st, Inc. is that company. We’ve established ourselves as the go-to provider for residential and commercial plumbing repairs in Raleigh, NC since 1993 and since then, our reputation has made us the best choice for service. 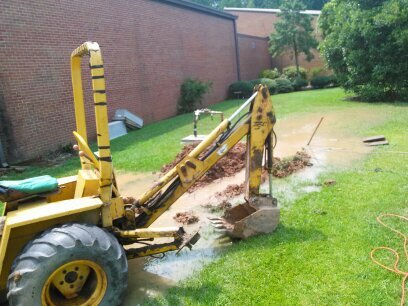 No matter the job, we can handle it—from simple leak detection and drain unclogging, to water and sewer line replacement and beyond. Our plumbing contractors in Raleigh, NC are adept at providing service across the total scope of your plumbing demands. We handle repairs, installations, replacements, maintenance and inspections, giving our customers peace of mind in our abilities no matter the situation. We even provide services that other plumbers don’t—including sales and installation of tankless water heaters and water filtration systems. Our goal is plumbing perfection in your home or business, and we’ll do what it takes to make sure you receive it. Contact us when you have plumbing needs and see why our customers are customers for life! We have more than 45 years of experience as residential and commercial plumbing experts. All tank-type water heaters purchased, and professionally installed by us come with a FULL 6-year manufacturers warranty. We’re the only company in the area that honors the manufacturer’s warranty. We’re a Master Plumber (license 17435 P1), bringing years of formal education and expertise to every job. We’re a certified dealer and installer for Rinnai and Noritz tankless water heaters. Our professionals complete all work on time, with 100% satisfaction guaranteed! Make your plumbing issues a thing of the past! We’re ready to provide you with a full gamut of services, to absolve any plumbing troubles you might be dealing with. Contact us today.